These are real Testimonials, all of which can be checked and verified. We used Geoff to move our twin axle caravan from a caravan site we were working on in Hampshire to our new site in Cornwall. Easy to use booking system, Geoff arrived on time to pick up the van and arrived promptly in Cornwall. He uses an app which tells you of his progress and time of arrival, great to know when to look out for him. On arrival Geoff was really helpful in siting the Caravan an made sure everything was good before he left. In short an excellent, and well priced service. Would recommend and will certainly use again should we need to move in the future. Had to move our twin axle from Wareham in Dorset up to The Peak District for its new season, as we don't tow anymore we did a search for a company that supplies that service and Caravan Towing Services came up. Asked some questions got the answers and prices back in a timely fashion, booked in and paid online. Didn't even need to be there on day of collection, Geoff collected the keys from the office and kept us informed of his journey up north via an app, which worked very well as we were meeting them at the new site. On arrival Geoff reversed the van onto its pitch and away they went. All in all excellent service, very easy to deal with and 2 very happy customers. Didn't envy the journey through Storm Freya but Geoff and van arrived safe and sound. Would recommend and use next time we need to move. We would like to thank you for your reliable professional service, very friendly, punctual and efficient, I would not hesitate to use you again or recommend you to others with confidence.thanks again. No fuss, friendly, informative and helpful...highly recommend. Just to say a huge thank you for your excellant efficient services today we highly recommend your service & will not hesitate to contact you again should we need to move our caravan. Great service at a fair price. Very easy and straightforward process - booking, payment, collection , delivery - simples! Thanks Geoff. We purchased a caravan and needed it towed from south Devon to South Wales. Geoff was our first enquiry and the price was fantastic. Very easily booked online after obtaining a very good quote, Geoff arranged to collect the van and bring it up to the site and within minute I received a text with a tracking site so that I could see where he was and how the journey was progressing. What a great addition to the service! I was able to time my arrival at the site to coincide perfectly with the arrival of the van, no guessing or waiting around for ages! He arrived bang on time and in perfect condition! We can not fault Geoff and the service. Fast, friendly and efficient! Can not recommend highly enough! We can't praise the service we received from you enough!! Although the weather has been atrocious you still managed to tow our caravan off the original site and take it from Cornwall to its new site in Devon. The lanes were narrow and very wet but your experience ensured the delivery was done safely and on time. You even managed to get it onto a water-logged site!! Brilliant, thank you!! My testimonial Excellent service and support I had my recently deceased fathers car, caravan and belongings in Spain and I had to get them back to the uk safely. The caravan was being brought into Portsmouth ferry terminal and I had to get it towed back to dawlish. As a "never towed a caravan before" driver I was panicking about the task. I found caravan towing services online and emailed my situation to Geoff who advised I ring him the next day to sort everything out. Geoff was kind and understanding of my plight and agreed to drive me upto Portsmouth ferry terminal and tow back the caravan. The caravan is now safely stored in a safe place and I cannot thank Geoff enough for his excellent service. Thanks for a very efficient service. We thought we were never going to get our caravan home as we had a bad accident in Scotland with our car which was written off and had to come home by train to Cambridgeshire and leave the caravan behind. We had originally arranged with a local haulier to bring it back but after 3 weeks of no action we needed to get it home as we needed some documents which were in the caravan. As soon as I spoke to Geoff about my problem I knew he would get it back as soon as he could for us. This was on a Monday afternoon and he said it would be home by Wed/Thursday. He telephoned the company who was storing the caravan for us and rang me back within an hour to confirm he could deliver as promised. Next day he rang to say he could deliver it a day earlier.On the day of delivery he telephoned en route to let let us know when he would arrive and he was on time. We were over the moon to see our caravan was home! Thanks for a very efficient service. I would like to thank Geoff for his professional and personal approach to moving our caravan from Warrington to mid wales on such short notice and at what I thought was a very reasonable price, I will definatly be using Geoff's services again, once again thank you. We would like to thank Geoff at caravan Towing Services for the excellent service and communication from start to finish. We look forward to seeing you again soon Best wishes ! Just wanted to say thank you so much for all your help with towing our caravan. From our point of view everything went smoothly. We have been very impressed with your professional and very friendly service and would highly recommend you. We have already passed your details onto a couple of friends who are considering a towing service. Thanks again and hope to see you another time. What a fantastic service you offer!! Thank you so much. Please feel free to use any part of my message as a testimonial on your website. I sometimes think people are all too quick to complain about poor service, but not quick enough to show their appreciation when they receive excellent service. Use my full name and area I live in and it might be an idea to put 'widow' next to my name if you like, but I'll leave that to you. I think there are probably many widows who enjoyed caravanning when their husbands were alive, but like me, don't have the confidence to tow a caravan on their own. Putting it on a seasonal pitch means they could still continue to take the grandchildren on holiday. I can't tell you how happy I was with the way everything went so smoothly yesterday. You kept me informed every step of the way and to be able to track your progress on the internet was great! You certainly made it in excellent time. I thought it would have taken you a lot longer than it did. I found your manner totally reassuring and you inspired me with complete confidence in your ability to deliver my caravan safely. The only thing I was concerned about was that tight left hand bend just outside the site, but again in your completely unflappable way, you negotiated that with no problem at all. It was a pleasure to meet you Geoff and when I want my caravan moved elsewhere, I will have no hesitation in calling on your services again. I will also recommend you to anyone looking for the same service. I was also very pleasantly surprised at how inexpensive the charge was for towing my caravan. I wish you and Nigel every success in your business, you deserve to succeed. Many thanks again All the best Barbara. Having been let down by another towing company to transport my caravan back from Abersoch, I found Caravan Towing Services off the internet. Initially I was very hesitant as I did not know anyone personally who had used their services before. However, our caravan needed to be moved by the following day so I had no choice. I can only say that any worries I had were quickly appeased once I started dealing with them. They were immensely professional at all times, courteous and actually delivered what they said they would. I would have no hesitation in using them again. Thanks for your brilliant service. We had just bought a used caravan from south Wales and needed to get it to a permanent site in Lancashire. While sourcing the caravan we realised that our car was marginally underweight for towing it - it was a bigun. However we really wanted this particular van and it was being permanently sited anyway. Enter Geoff and Caravan Towing Services. They took care of everything from first to last, even pitching the caravan at its destination. It was also great to see exactly where he was in transit on the website also. That meant we could time it exactly to meet him there! The price was very reasonable for such a distance. Thanks again for your efficient and courteous service. Dave H.
Geoff recently collected our Caravan from a site in Cumbria and returned it to our home in Lancashire. The service was both professional and courteous. Geoff's attention to detail in pre checking our Caravan, hitching up, towing and re-siting at our home was excellent. 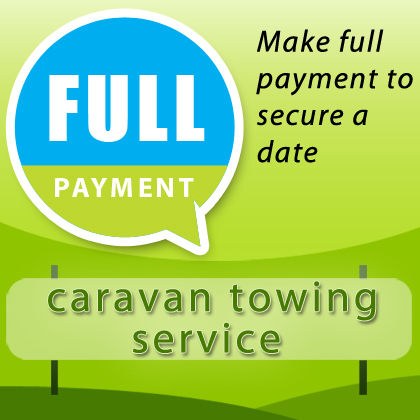 I will be using his services again next April and have no hesitation in recommending Caravan Towing Services to anybody needing this type of service. I contacted this company one afternoon and by lunch time the next day my caravan was delivered safely from the lake district to my home in county Durham. no fuss no hassle I was informed of the progress throughout so no guesswork, a friendly efficient professional service! I cannot recommend this company highly enough. CARAVAN DELIVERED THE NEXT DAY AFTER ACCEPTING GEOFF QUOTE. VERY GOOD FAST SERVICE AND GEOFF KEPT US UP TO DATE ON HIS JOURNEY DOWN TO US. IF YOU NEED A CARAVAN MOVING,THIS IS THE MAN FOR YOU. 100% RECOMMENDED. THANKS AGAIN GEOFF. Really helpful, professional and flexible. Plenty of other organisations could learn from Geoff's quality of service. Geoff provided at excellent swift service, he had to deal with two tyre punctures and poor weather while towing out caravan back from Wales. We will definitely use him again. Many thanks Geoff- towed our van from Wales to near Newark without a problem. Great communication,fast efficient service and all round nice bloke. If you need a caravan moving safely- this is the man for the job. Nice, hassle free transaction, great people to deal with, friendly, professional and efficient. Very reasonable quote supplied quickly, very accommodating arranging the details. I would definitely recommend. 5 star service. Thanks. We are new to caravanning, and wanted to site our caravan in Devon, but were stumped as to how we would get it there, until we came across this website. Geoff was really accommodating and approachable, he arrived to collect the caravan in plenty of time and helped us to put it onto pitch when we arrived in Devon, really made the experience stress free, would highly recommend!! If you want prompt and reliable moving of your caravan then look no further.geoff moved our caravan from North Yorkshire to Derbyshire on the day and time requested, you can't ask for more. Thanks Geoff. My experience of using Caravan Towing Services was excellent from start to finish, Geoff's customer rapport is friendly and warm, he was very helpful and didn't mind me keep pestering him with questions!! I would recommend this company highly. Fantastic service from start to finish. Geoff replied to our initial enquiry promptly and was able to carry out the tow on the day we required at fairly short notice. On the day, he kept us informed and was 15 minutes early for the pick up. The caravan was delivered and parked at our home with no fuss at all. Five star service from start to finish, we would certainly recommend Geoff and his company. Thanks Geoff. For me, it was without doubt the right decision to hand the reins over to Geoff. The delivery went like clockwork, and was parked spot on. I would recommend Caravan Towing Services in every respect and without reservation. I needed a little caravan picking up from Cardiff and delivered to Portsmouth, found Geoff online, read a few of the testimonials and sent an enquiry. He responded the following day with a very competitive quote and I booked the delivery for his next available date which was a week later. He kept in touch throughout the whole process, and the caravan has arrived safely today. Thank you so much, you made it a very easy service and I will sing your praises to everyone, and keep your number for future moves. Just brilliant! Fantastic service, even in the snow! Geoff was fantastic from start to finish. He kept us well informed at every stage, making sure we were happy, and found our location easily and on time. He was friendly, very capable, and an all round fantastic guy. He was amazingly capable and handled our caravan brilliantly, even in the snowy conditions. We can't recommend the service highly enough! Thanks again! Excellent service, kept me informed all along the way. Friendly, professional and trustworthy. Would certainly use this company again with confidence. Professional, competent and friendly. Excellent communication and service. Moved my twin axle 100 miles from dealer to seasonal pitch. Weather was awful. 40 mph winds and sleet. Assisted with pitching. Highly recommended. ***** 5 stars. Thank you Geoff. Great service from beginning to end. A fair price and really good communication and customer service. Genuinely helpful, pleasant guys. Would very happily use again and recommend to anyone! Thanks. Absolutely faultless service from Geoff. So helpful and professional. Wouldn't hesitate to use again and recommend to others. Thank you so very much. Very quick and efficient service from Geoff. Collected my caravan from storage in Lancashire and delivered it to my home in Tyldesley in excellent time. And for a very reasonable price. Would not hesitate to use Geoff again if the need arose. Brilliant service. Phil.